Consumers can use YOO.ID for a variety of advantages. YOO.ID can be used for signing into gyms, day nurseries, schools, offices, bars & nightclubs and for proving ones age or ID when purchasing age restricted products. YOO.ID uniquely identifies and is able to confirm that the tradesperson at your door is licensed, insured, not bankrupt and fully prepared to prove they’re above board. YOO.ID can be used to verify that the taxi driver you’ve booked to take you on your journey has been granted a licence by the local council and not an impostor. public, and private bodies for a number of years. 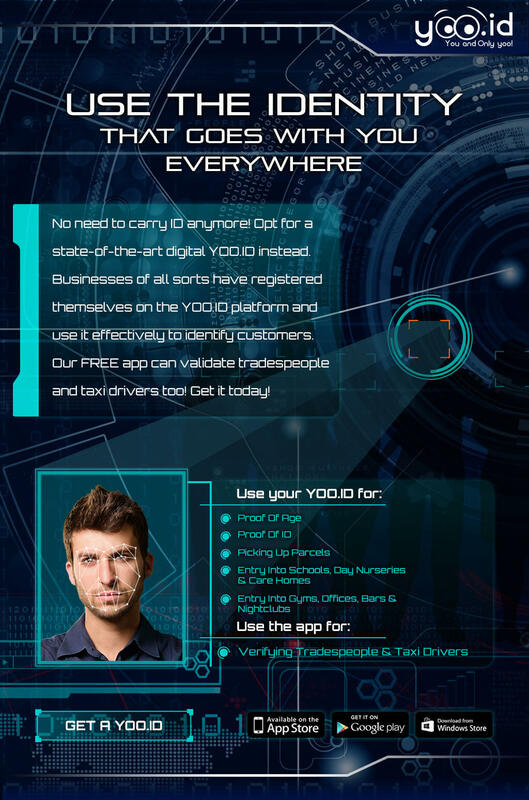 Businesses can use YOO.ID for a variety of advantages. Licensee’s – Bars, nightclubs & off-licences can use YOO.ID as a robust system for confirming proof of age, helping to comply to legal and due diligence obligations. Businesses – All sorts of businesses can register on YOO.ID and provide a facial recognition system to effectively identify their members, customers or staff. Tradespeople & Taxi Drivers – Registering a YOO.ID can give potential customers the peace of mind of knowing it’s you and not an impostor trying to fool them.